California with its beautiful beaches, coastline and hills is one of the most scenic states in the continental US. It has cliffs, hills and desert areas with beautiful sunsets, wildlife, a great climate and lots of fun activities coming with all these sceneries. You can watch whales and seals on the coast all year long, enjoy the sunlight, and relax in the easy going atmosphere of this state. California was named after Queen Califia, a character in the book written by Garcia de Montalvo. The state is known for giant sequoia and in general spectacular redwood forests. It is also the home of Disneyland. This campsite accommodates any size and type of RV. There is a large meeting room, an arcade for kids, and even free Wifi. The camp is open all year long. There is handicap access, full hookups, game room, heated pool, playground, a recreational hall and a spa as well. This makes Mad River Rapids RV Park a great family park where everybody can have fun. Other amenities include dump station, grocery, laundry, newspaper, RV supplies, self-service RV wash, showers, snack bars and so on. It is a good choice if you decide to visit California. The Durango RV Resort is one of the Best RV Resorts in the Redding Area. It has luxurious amenities such as pet facilities like dog wash & run, outdoor gathering spaces, two clubhouses with kitchen and meeting facilities for up to 150 people. It has a pool and spa, outdoor fireplaces and fire pits. There is also a grocery store nearby, an outdoor recreation area with sport court, bocce ball, horseshoes, and paddle tennis courts. What else do you need for a perfect vacation? You can also enjoy the surroundings and go fishing or golfing. Other outdoor activities that you can enjoy here are hiking, biking, bird-watching, rafting and more. If you love San Francisco, you will also like Novato Park, which is conveniently located in the San Francisco Bay area. It will only take you a few minutes to reach the legendary Golden Gate Bridge and the fascinating downtown area of San Francisco. The Novato RV Park comes with full hookups and the necessary comfort. There is free WiFi, cable TV, pool, pet walk area and showers. The mesmerizing park of Muir Woods is located in close proximity to the RV Park so you can enjoy the beauty of the serene and sublime red wood trees that reach up to the skies. Muir Wood is home of some of the biggest trees in the USA and one of those “must-to-see” areas. The Vineyard RV Park is located close to beautiful places such as Napa Valley, San Francisco, Sacramento and California Beaches. You can enjoy wine tasting in Napa Valley, walk around in downtown San Francisco, and see all it has to offer. There is free WiFi and cable TV. There are some rental cabins as well for more comfort. You can come with your pet and use the two off-leash dog walks, enjoy the sparkling clean restrooms and showers, a swimming pool, the catch and release pond, two 24-hour laundry rooms, the propane filling station and more. For kids there is a playground and a ping pong table. There is also a group meeting facility at the park. Not only that you can camp here with your RV, but you can also rent cabins and even yurts, all for affordable prices. You can enjoy hiking, fishing and mountain biking in the area. There is full hookup for RVs with picnic table, fire ring and cable hookup. On nearby farm you will find alpacas. The Park’s clubhouse is perfect for larger groups and meetings. There are also - playground area, game areas, barbeque area and swimming pool. You can explore the surroundings by foot or by bike using the nature trails. And now a bonus - a trip through some of California's most prestigious national parks: Muir Woods, Yosemite, Hetch Hetchy, Seqouia, Kings Canyon Crater park and Death Valley. You have decided to vacation at a campground RV park Southern California because the kids want to visit Disneyland and you have always wanted to visit the California coast. When my wife and I visited the area years age we looked for and found an Oceanside campsite. From there we toured all up and down the California coast and even took an overnighter into Mexico. You can have your choice of types of recreational vehicle camp sites. Every kind of campground is available in California. There are luxury RV resort campgrounds with all of the amenities you could want including wireless internet access. Before you start out on your trip you should join the Good Sam Club. They offer links to RV resorts for camping, roadside assistance service, and member only forums where you can find and join discussions on all aspects of Rving, Also they offer a 10% discount at any participating campground southern California has. 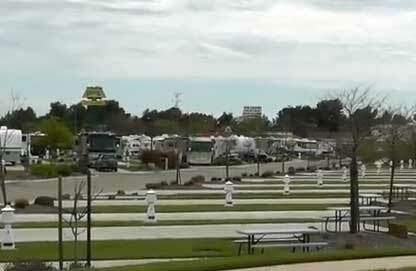 Other Rvers will tell you which is the best campground rv park Southern California offers and which ones you should avoid. Our friends Jack and Nan found a campground KQ Ranch RV Camping Resort, in Julian, California that has a horse corral at each campsite and riding trails. So they could bring their granddaughter and her horse. Nan heard about this campground from a friend in the Good Sam Club. Another friend of ours is looking for RV parks for sale in Southern California. They want to help others enjoy the Rving lifestyle the way they do.